David Abeyta, Terry Abeyta and John Kapuza (left to right) accept “Best Law Firm” awards at the 2017 Reader’s Choice celebration. During 2017, Abeyta Nelson Injury Law was honored to have been voted Best Law Firm, Best Personal Injury Law Firm, and Best Attorney by readers of the Yakima Herald-Republic and Yakima Valley Business Times newspapers. On September 26, the staff of the Yakima Herald-Republic newspaper hosted a well-attended awards celebration at Yakima’s downtown 4th Street Theatre to announce the results of its first ever “Reader’s Choice” Awards. More than 10,000 readers from the Greater Yakima Valley cast their ballots and voted for their favorite local businesses in 150 categories. 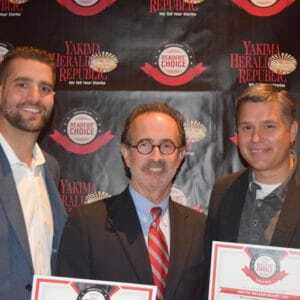 At this event, Abeyta Nelson Injury Law was honored with two awards: Best Law Firm and Best Personal Injury Law Firm. A week later, the Yakima Valley Business Times released the results of its 15th annual “Best of the Valley” reader’s poll, and Abeyta Nelson Injury Law was voted by its readership of approximately 20,000 as Best Attorney. Terry Abeyta, Senior Partner of Abeyta Nelson Injury Law, said, “We thank our clients, friends, and neighbors for selecting us as Best Law Firm, Best Personal Injury Law Firm, and Best Attorney in Central Washington. This recognition means the world to us.” Abeyta continued, “We’ve been putting the interests of our clients first for more than 36 years. We’ve also given back to our community through leadership and financial support of many non-profits, charitable organizations, education, and the arts. We’re not going anywhere. We’ll continue to work to make this community a better, safer place to work and to raise our families,” Abeyta said. Thank you, voters, for nominating and casting your ballot for Abeyta Nelson Injury Law. We are truly grateful for your vote of confidence in us.